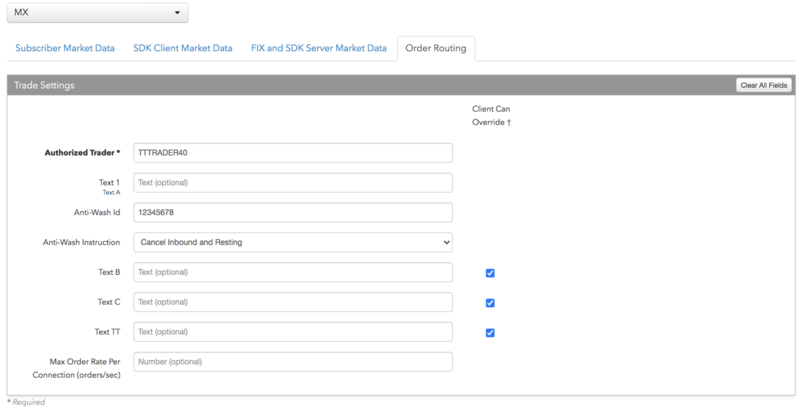 Authorized Trader ID — Sets the routing trader ID to identify the user on all order actions. This value maps to the TraderID field in the exchange API. Enter the exchange-provided routing trader ID. This field is required for order routing. Text 1 — An optional, user-defined text value that remains on submitted orders in the TT system and is sent to the exchange in the Memo field in the exchange API. Enter up to a maximum of 25 characters. Alpha-numeric and special characters are allowed. Text B — An optional, user-defined text value that remains on submitted orders in the TT system. If entered, this value is sent as Tag 1 instead of the Clearing Account value. Alpha-numeric and special characters are allowed. Anti-Wash Id — Sets the user-defined Anti-Wash Id, which is required for enabling the exchange's Anti-Wash functionality for a user. To disable Anti-Wash for a user, remove the ID value from this field and leave the field blank. The Anti-Wash Id field is required for MX if an Anti-Wash Instruction is set for the user. Enter up to eight alpha-numeric characters (no special characters). This value is sent as the "AntiWashId" in the exchange API. By default, this field is blank and Anti-Wash functionality for the user is disabled at the exchange. Cancel Inbound and Resting — If the user enters a self-matching order, the exchange will cancel both the incoming and resting orders. Cancel Inbound — If the user enters a self-matching order, the exchange will cancel the newly entered (aggressing) order. The resting order remains at the exchange. Cancel Resting — If the user enters a self-matching order, the exchange will cancel the user's resting order and accept the newly entered order. This value is sent as the "AntiWashInstruction" in the exchange API.